Running Saturday, August 4, 2018 through Sunday, August 12 2018 concurrently in Toronto’s Aviva Centre and Montreal’s IGA Stadium, Tennis’ finest are descending upon Toronto for the 138th edition (for men) and 127th edition (for women) of the Canadian Open, known as Rogers Cup, presented by National Bank. The event will see men competing in the former and women competing at the latter. Kicking it all off tonight at Toronto’s The Rec Room was a festive bash with Tournament Director Karl Hale and Vasek Pospisil, who is set to compete early next week. Vancouver-born Pospisil who has been ranked as high as #25 in the world back in 2014, currently sits at #92 with career earnings of over $5.05 million. He chat with partygoers and in a round of rapidfire questioning from Hale, he reveals that he loves sushi, brunettes and is in fact single. He also says that of all competitions he’s been to, Wimbledon still remains his favourite. Causing a ‘racket’! 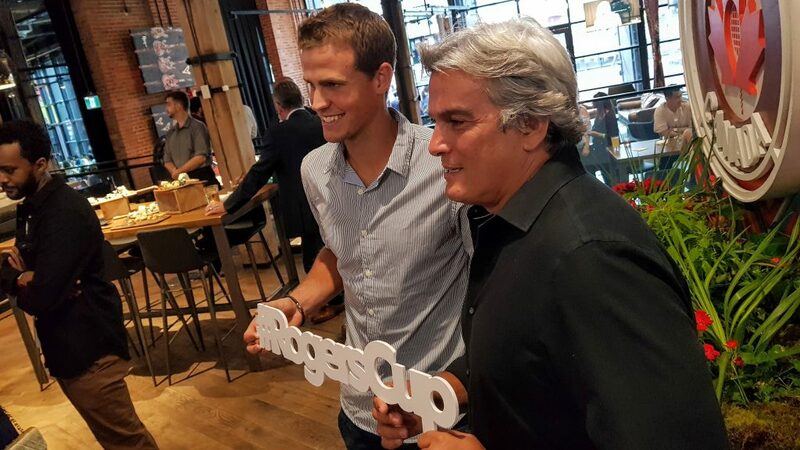 Fun kicking-off #RogersCup with #VasekPospisil, who is slated to play early next week! Good luck to Vasek, whom in response to some rapidfire questioning revealed he’s single, loves brunettes, sushi and counts Wimbeldon as his favourite competition!  Swipe left for more. Get your tickets and learn more about the Rogers Cup now here!